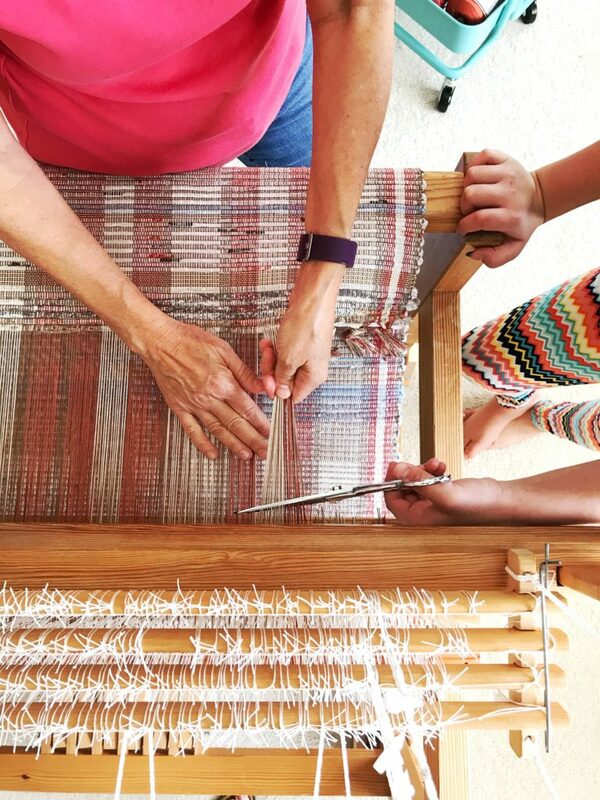 Any handweaver who finds willing and able help is indeed fortunate. If you find an apprentice you love to have at your side, that’s even better. 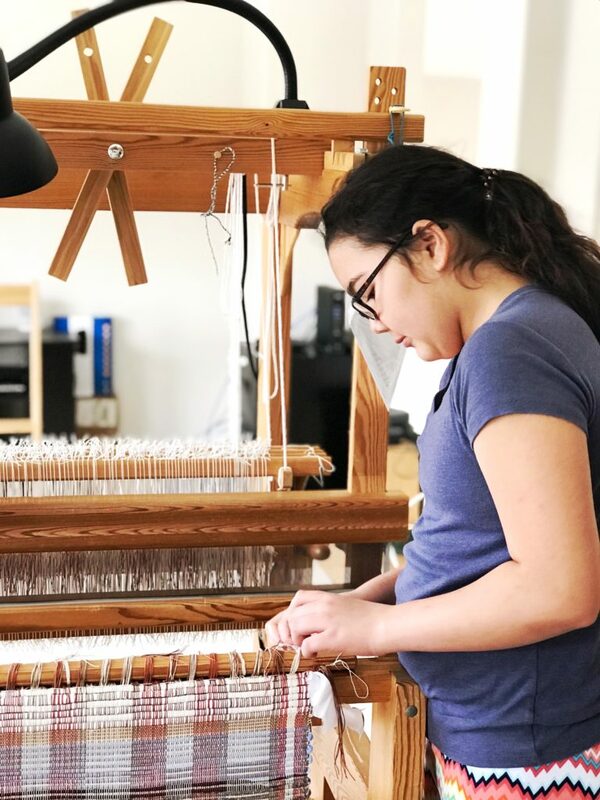 I consider myself especially blessed to have such an apprentice—a young lady who frequents my weaving studio and shares my delight in the wonder of turning threads into cloth. 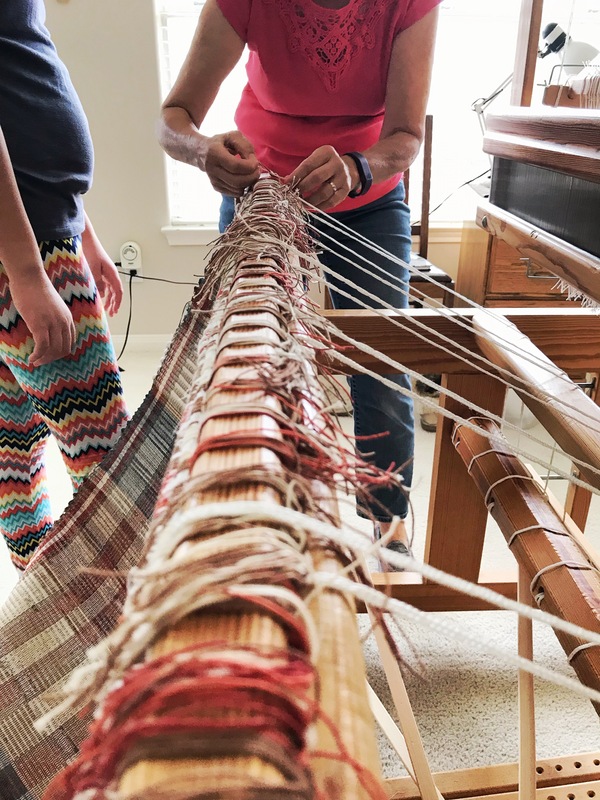 First time at the big loom. 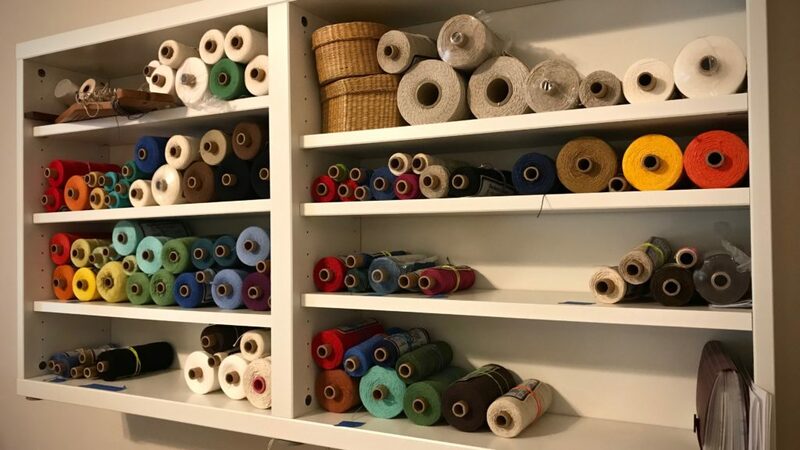 Cotton and linen tubes of thread are all sorted by type and arranged by color. Thanks to my young apprentice. 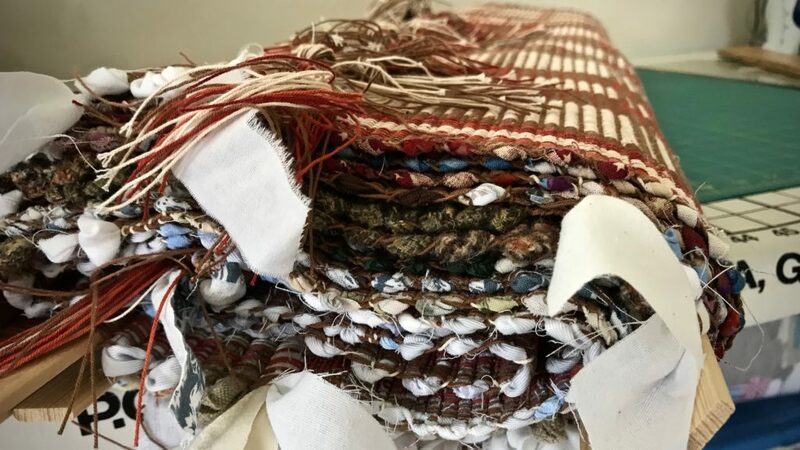 Juliana assisted on this spaced rep rag rug project from start to finish. 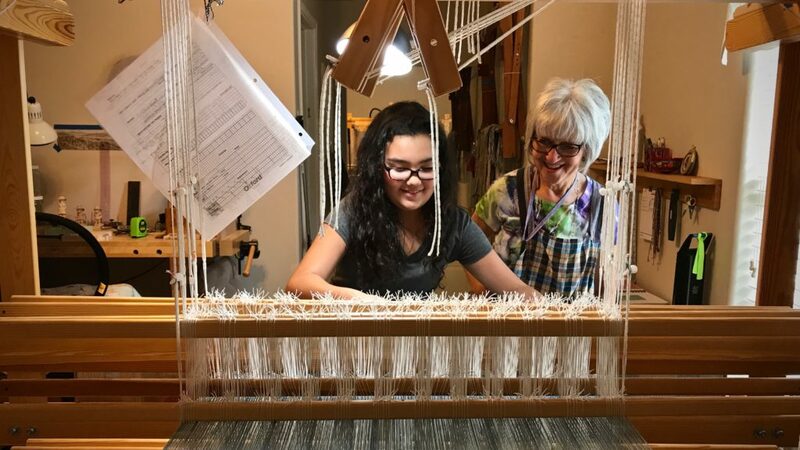 She helped me beam the warp and thread the heddles. I wove four of the rugs, and she wove one complete rug herself. It is only fitting for her to help with the cutting off! 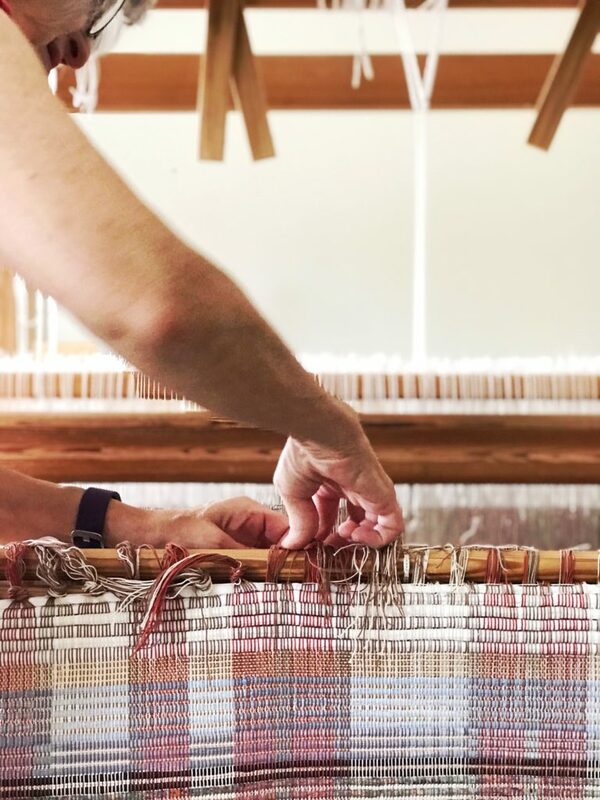 And, oh, what a joy it is to see freshly woven rugs roll off the cloth beam! Finishing the rugs is still ahead. When we have them hemmed, I will bring you an update with pictures of our completed treasures. Five rag rugs rolled up. Next step is to tie warp ends and hand-stitch hems. May you keep your youthful delight. What a joy and delight for you BOTH! Juliana is beautiful and a wise one indeed to choose a true master at the loom for her mentor. It is always best, when possible, to learn from the most skilled, talented, and wise teachers. Hi Julia, It’s when we teach others that we learn the most. I’m still learning, so it’s great to have someone to share in the process! Thanks for your kind and generous thoughts! Juliana is as fortunate to have you as a teacher as you are to have her as an apprentice. She seems very captivated by the process. Looking forward to seeing your next joint effort. 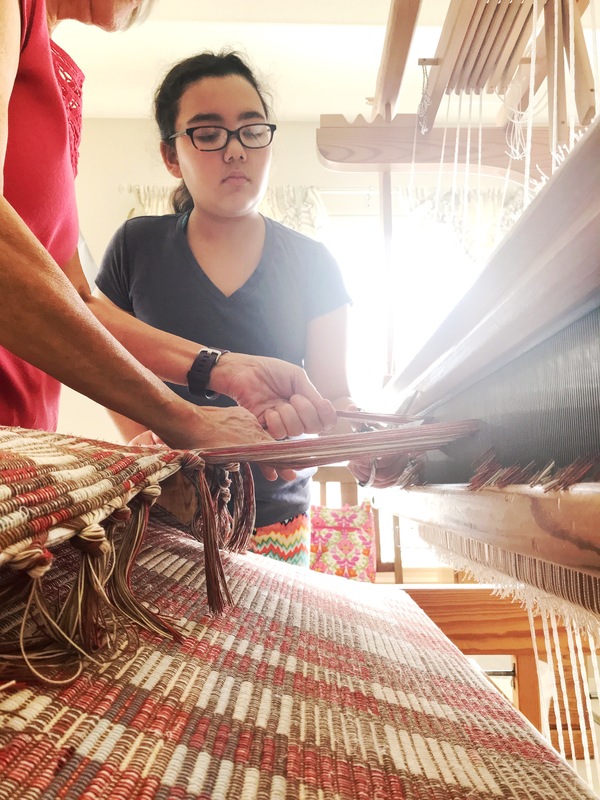 Hi Beth, It is invigorating for me to witness this sweet young lady’s fascination with weaving. Her expressions of delight so often match how I feel about the process. If I move to Texas, could I be your *old* apprentice?? Hi Marjorie, I appreciate your confidence in me. 🙂 It may be a while since I take only one apprentice at a time. Lucky Juliana to have you for. a teacher! D’Anne, You are so sweet! Honestly, I’m the fortunate one. 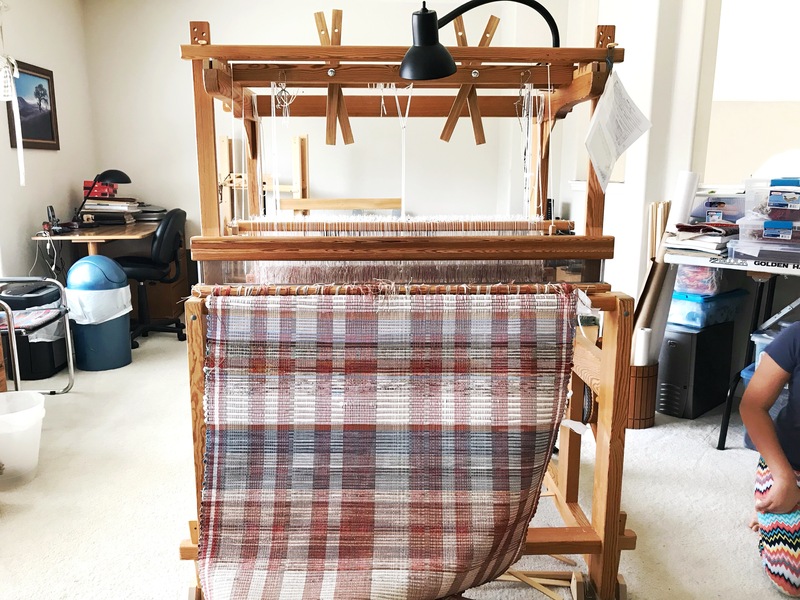 I am a returning weaver (had a 4 shaft table loom in the ’70’s…and now have a Glimakra Ideal. I’m wondering about storing my cones and tubes of fiber…how do you deal with dust and fading if they are stored on open shelves? 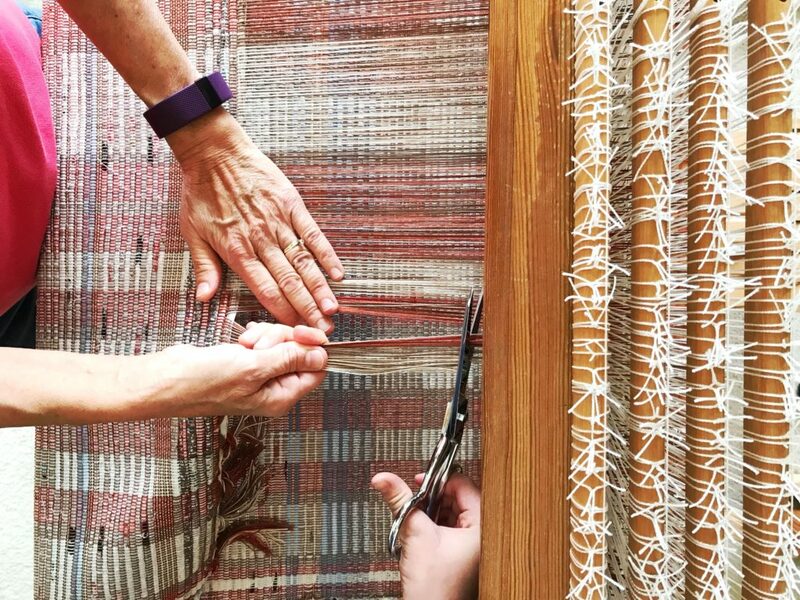 Hi Jane, Welcome back to the world of weaving! I’m sure you’ll enjoy getting back in the swing of things. What a wonderful opportunity for you both! 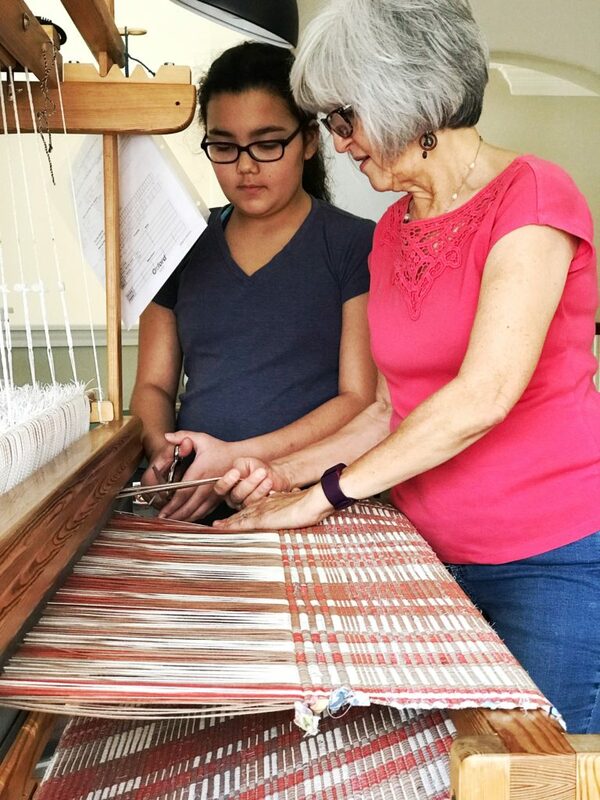 She can learn the joy of learning and of weaving at the hand of a mentor and you can share your love and knowledge with her thus learning more as well! I agree that teaching others is always the best way to learn more ourselves and the gift of sharing that knowledge is priceless! Bless you both! Hi Charlynn, I couldn’t agree more. It’s a wonderful opportunity for both of us. This is a win – win arrangement! I appreciate your thoughtful words!